3 Stripers on 1 Umbrella Rig! With over 40 years experience fishing Lake Allatoona, I am proud to call this my home lake. At just 30 miles north of Atlanta, it is minutes from Lake Point Sports in Emerson Georgia. Allatoona provides great fishing opportunities. This clear water impoundment has a substantial population of Striped Bass, Hybrid Striped Bass, Spotted Bass, and a multitude of Panfish species. Recent stocking programs of Largemouth Bass have anglers optimistic for the return of this popular game fish. Most days clients enjoy catching multiple fish species during an outing providing smiling faces and lasting memories! Red Top Mountain State Park boat ramp (exit #285 I75) works well as a meeting spot, however, many public boat ramps are available at various locations around the lake. Also,other rendezvous points are available upon request. This is an awesome jewel that feeds Lake Allatoona from the North Georgia mountains. The fishing and scenery are equally amazing. 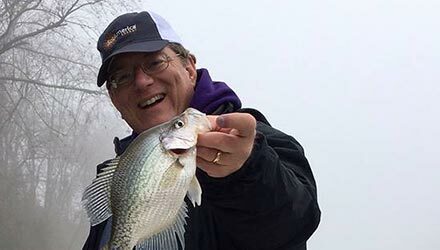 The upper Etowah begins to come alive first with the spring spawning run of Crappie and White Bass. Beginning in February and March, waves of fish will show up and can be caught with a variety of live and artificial baits. As the Full moon of March arrives, it will be time to do battle with Striped Bass, and Hybrid Striped Bass making their way north out of Lake Allatoona into the beautiful upper Etowah. 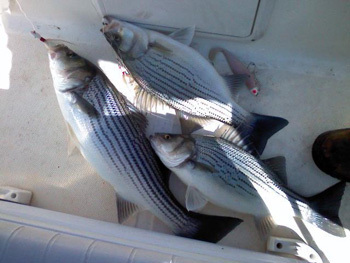 Many of the biggest Striped Bass of the year are caught during this season. This unique water way begins as water is released from the dam below Lake Allatoona making for cold, oxygenated water ideal for Striped Bass during the hot months of summer. Beginning in early summer an impressive migration begins as Striped Bass make their journey out of Weiss Lake in Northeastern Alabama to spend the summer in this cold water refuge.The sights and sounds of nature from a day spent on the Lower Etowah are calming, however, the fishing is as intense as it gets with explosive strikes from hungry Stripers fished with live bait and artificial lures. Trips for the lower Etowah river are typically from June to September, and are fished from a custom jet boat. This river is formed in Rome Georgia by the combination of the Etowah and Oostanuala River. 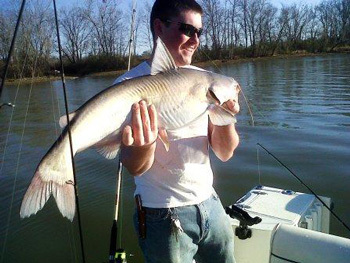 Bigger river water, bigger bait, bigger catfish, bigger….you get the point. In this muddier water, we take our center consoles to chase some great fish. Its a great mix of lake and river fishing styles. This water seems to hold better bait and is truly a catfish fisherman’s dream. Our meeting place is minutes outside of western Rome, Georgia. The Coosa River will have a fish bite sometimes when all other waters around are getting a little warm for our Georgia Sport Fish.